The Connection type is used for D-Bus connections to remote peers such as a message buses. It is a low-level API that offers a lot of flexibility. For instance, it lets you establish a connection over any transport that can by represented as an IOStream. This class is rarely used directly in D-Bus clients. If you are writing a D-Bus client, it is often easier to use the Gio::DBus::own_name(), Gio::DBus::watch_name() or Gio::DBus::Proxy::create_for_bus() APIs. Signature for slot used in add_filter(). A filter function is passed a Message and expected to return a Message too. Passive filter functions that don't modify the message can simply return the message object. Filter functions that wants to drop a message can simply return 0. And filter function may modify a message by copying it and return the copy. Signature for slot used in signal_subscribe(). Glib::ustring& signal_name, const Glib::VariantContainerBase& parameters);. Filters are handlers that are run on all incoming and outgoing messages, prior to standard dispatch. Filters are run in the order that they were added. The same handler can be added as a filter more than once, in which case it will be run more than once. Filters added during a filter slot won't be run on the message being processed. Filter slots are allowed to modify and even drop messages. Note that filters are run in a dedicated message handling thread so they can't block and, generally, can't do anything but signal a worker thread. Also note that filters are rarely needed - use API such as send_message_with_reply(), signal_subscribe() or call() instead. If a filter consumes an incoming message the message is not dispatched anywhere else - not even the standard dispatch machinery (that API such as signal_subscribe() and send_message_with_reply() relies on) will see the message. Similary, if a filter consumes an outgoing message, the message will not be sent to the other peer. A filter identifier that can be used with remove_filter(). Asynchronously invokes the method_name method on the interface_name D-Bus interface on the remote object at object_path owned by bus_name. If the connection is closed then the operation will fail with Gio::IO_ERROR_CLOSED. If cancellable is cancelled, the operation will fail with Gio::IO_ERROR_CANCELLED. If parameters contains a value not compatible with the D-Bus protocol, the operation fails with Gio::IO_ERROR_INVALID_ARGUMENT. If reply_type is non-0 then the reply will be checked for having this type and an error will be raised if it does not match. Said another way, if you give a reply_type then any non-0 return value will be of this type. This is an asynchronous method. When the operation is finished, callback will be invoked in the thread-default main loop of the thread you are calling this method from. You can then call call_finish() to get the result of the operation. See call_sync() for the synchronous version of this function. object_path Path of remote object. interface_name D-Bus interface to invoke method on. method_name The name of the method to invoke. parameters A Glib::VariantContainerBase tuple with parameters for the method or 0 if not passing parameters. slot A SlotAsyncReady to call when the request is satisfied. bus_name A unique or well-known bus name or an empty string if the connection is not a message bus connection. timeout_msec The timeout in milliseconds, -1 to use the default timeout or G_MAXINT for no timeout. flags Flags from the Gio::DBus::CallFlags enumeration. reply_type The expected type of the reply, or 0. A non-cancellable version of call(). Like call() but also takes a GUnixFDList object. This is an asynchronous method. When the operation is finished, callback will be invoked in the thread-default main loop of the thread you are calling this method from. You can then call call_with_unix_fd_finish() to get the result of the operation. See call_sync() for the synchronous version of this function. A non-cancellable version of call() (with a UnixFDList). Finishes an operation started with call(). res A AsyncResult obtained from the SlotAsyncReady passed to call(). A Variant tuple with return values. Finishes an operation started with call() (with a UnixFDList). out_fd_list Return location for a UnixFDList. The calling thread is blocked until a reply is received. See call() for the asynchronous version of this method. A non-cancellable version of call_sync(). Like g_dbus_connection_call_sync() but also takes and returns UnixFDList objects. bus_name A unique or well-known bus name or nullptr if connection is not a message bus connection. parameters A Variant tuple with parameters for the method or nullptr if not passing parameters. reply_type The expected type of the reply, or nullptr. out_fd_list Return location for a UnixFDList or nullptr. cancellable A Cancellable or nullptr. nullptr if error is set. Otherwise a Variant tuple with return values. Free with Glib::variant_unref(). Note that this never causes the process to exit (this might only happen if the other end of a shared message bus connection disconnects, see property_exit_on_close()). Once the connection is closed, operations such as sending a message will return with the error Gio::IO_ERROR_CLOSED. Closing a connection will not automatically flush the connection so queued messages may be lost. Use flush() if you need such guarantees. If the connection is already closed, this method fails with Gio::IO_ERROR_CLOSED. When the connection has been closed, the "closed" signal is emitted in the thread-default main loop of the thread that connection was constructed in. This is an asynchronous method. See close_sync() for the synchronous version. This is an asynchronous method. When the operation is finished, slot will be invoked in the thread-default main loop of the thread you are calling this method from. You can then call close_finish() to get the result of the operation. See close_sync() for the synchronous version. Finishes an operation started with g_dbus_connection_close(). res A AsyncResult obtained from the SlotAsyncReady passed to g_dbus_connection_close(). The calling thread is blocked until this is done. See g_dbus_connection_close() for the asynchronous version of this method and more details about what it does. The D-Bus connection will interact with stream from a worker thread. As a result, the caller should not interact with stream after this method has been called, except by calling Glib::object_unref() on it. If observer is not nullptr it may be used to control the authentication process. When the operation is finished, slot will be invoked. You can then call g_dbus_connection_new_finish() to get the result of the operation. This is a asynchronous failable constructor. See g_dbus_connection_new_sync() for the synchronous version. guid The GUID to use if a authenticating as a server or nullptr. flags Flags describing how to make the connection. observer A Gio::DBus::AuthObserver or nullptr. user_data The data to pass to slot. Finishes an operation started with g_dbus_connection_new(). res A AsyncResult obtained from the SlotAsyncReady passed to g_dbus_connection_new(). A Gio::DBus::Connection or nullptr if error is set. Free with Glib::object_unref(). This constructor can only be used to initiate client-side connections - use g_dbus_connection_new() if you need to act as the server. In particular, flags cannot contain the Gio::DBus::ConnectionFlags::AUTHENTICATION_SERVER or Gio::DBus::ConnectionFlags::AUTHENTICATION_ALLOW_ANONYMOUS flags. This is a asynchronous failable constructor. See g_dbus_connection_new_for_address_sync() for the synchronous version. Finishes an operation started with g_dbus_connection_new_for_address(). This constructor can only be used to initiate client-side connections - use g_dbus_connection_new_sync() if you need to act as the server. In particular, flags cannot contain the Gio::DBus::ConnectionFlags::AUTHENTICATION_SERVER or Gio::DBus::ConnectionFlags::AUTHENTICATION_ALLOW_ANONYMOUS flags. This is a synchronous failable constructor. See g_dbus_connection_new_for_address() for the asynchronous version. Synchronously sets up a D-Bus connection for exchanging D-Bus messages with the end represented by stream. This is a synchronous failable constructor. See g_dbus_connection_new() for the asynchronous version. This can only fail if parameters is not compatible with the D-Bus protocol. interface_name D-Bus interface to emit a signal on. signal_name The name of the signal to emit. destination_bus_name The unique bus name for the destination for the signal or an empty string to emit to all listeners. parameters A Glib::VariantContainerBase tuple with parameters for the signal or 0 if not passing parameters. Exports action_group on connection at object_path. The implemented D-Bus API should be considered private. It is subject to change in the future. A given object path can only have one action group exported on it. If this constraint is violated, the export will fail and 0 will be returned (with error set accordingly). You can unexport the action group using g_dbus_connection_unexport_action_group() with the return value of this function. The thread default main context is taken at the time of this call. All incoming action activations and state change requests are reported from this context. Any changes on the action group that cause it to emit signals must also come from this same context. Since incoming action activations and state change requests are rather likely to cause changes on the action group, this effectively limits a given action group to being exported from only one main context. object_path A D-Bus object path. The ID of the export (never zero), or 0 in case of failure. Exports menu on connection at object_path. An object path can only have one menu model exported on it. If this constraint is violated, the export will fail and 0 will be returned (with error set accordingly). You can unexport the menu model using g_dbus_connection_unexport_menu_model() with the return value of this function. Asynchronously flushes the connection, that is, writes all queued outgoing message to the transport and then flushes the transport (using Gio::OutputStream::flush_async()). This is useful in programs that wants to emit a D-Bus signal and then exit immediately. Without flushing the connection, there is no guarantee that the message has been sent to the networking buffers in the OS kernel. This is an asynchronous method. See flush_sync() for the synchronous version. This is an asynchronous method. When the operation is finished, slot will be invoked in the thread-default main loop of the thread you are calling this method from. You can then call flush_finish() to get the result of the operation. See flush_sync() for the synchronous version. Finishes an operation started with g_dbus_connection_flush(). res A AsyncResult obtained from the SlotAsyncReady passed to g_dbus_connection_flush(). The calling thread is blocked until this is done. See g_dbus_connection_flush() for the asynchronous version of this method and more details about what it does. Asynchronously connects to the message bus specified by bus_type. When the operation is finished, slot will be invoked. You can then call get_finish() to get the result of the operation. This is a asynchronous failable function. See get_sync() for the synchronous version. Gets the capabilities negotiated with the remote peer. Zero or more flags from the DBusCapabilityFlags enumeration. Gets whether the process is terminated when connection is closed by the remote peer. See Gio::DBus::Connection::property_exit_on_close() for more details. Whether the process is terminated when connection is closed by the remote peer. Finishes an operation started with g_bus_get(). The returned object is a singleton, that is, shared with other callers of g_bus_get() and g_bus_get_sync() for bus_type. In the event that you need a private message bus connection, use g_dbus_address_get_for_bus_sync() and g_dbus_connection_new_for_address(). Note that the returned Gio::DBus::Connection object will (usually) have the Gio::DBus::Connection::property_exit_on_close() property set to true. res A AsyncResult obtained from the SlotAsyncReady passed to g_bus_get(). Gets the flags used to construct this connection. Zero or more flags from the DBusConnectionFlags enumeration. The GUID of the peer performing the role of server when authenticating. See Gio::DBus::Connection::property_guid() for more details. The GUID. Do not free this string, it is owned by connection. Retrieves the last serial number assigned to a Gio::DBus::Message on the current thread. This includes messages sent via both low-level API such as g_dbus_connection_send_message() as well as high-level API such as g_dbus_connection_emit_signal(), g_dbus_connection_call() or g_dbus_proxy_call(). The last used serial or zero when no message has been sent within the current thread. This will always return nullptr unless connection acted as a server (e.g. Gio::DBus::ConnectionFlags::AUTHENTICATION_SERVER was passed) when set up and the client passed credentials as part of the authentication process. In a message bus setup, the message bus is always the server and each application is a client. So this method will always return nullptr for message bus clients. A Credentials or nullptr if not available. Do not free this object, it is owned by connection. Gets the underlying stream used for IO. While the Gio::DBus::Connection is active, it will interact with this stream from a worker thread, so it is not safe to interact with the stream directly. The stream used for IO. Synchronously connects to the message bus specified by bus_type. Note that the returned object may shared with other callers, e.g. if two separate parts of a process calls this function with the same bus_type, they will share the same object. This is a synchronous failable function. See g_bus_get() and g_bus_get_finish() for the asynchronous version. Gets the unique name of connection as assigned by the message bus. This can also be used to figure out if connection is a message bus connection. The unique name or nullptr if connection is not a message bus connection. Do not free this string, it is owned by connection. Gets whether connection is closed. Flags from the DBusCapabilityFlags enumeration representing connection features negotiated with the other peer. A boolean specifying whether the connection has been closed. A boolean specifying whether the process will be terminated (by calling raise(SIGTERM)) if the connection is closed by the remote peer. Note that Gio::DBus::Connection objects returned by g_bus_get_finish() and g_bus_get_sync() will (usually) have this property set to true. Flags from the DBusConnectionFlags enumeration. If you are constructing a Gio::DBus::Connection and pass Gio::DBus::ConnectionFlags::AUTHENTICATION_SERVER in the Gio::DBus::Connection::property_flags() property then you MUST also set this property to a valid guid. If you are constructing a Gio::DBus::Connection and pass Gio::DBus::ConnectionFlags::AUTHENTICATION_CLIENT in the Gio::DBus::Connection::property_flags() property you will be able to read the GUID of the other peer here after the connection has been successfully initialized. The unique name as assigned by the message bus or nullptr if the connection is not open or not a message bus connection. Registers slots for exported objects at object_path with the D-Bus interface that is described in interface_info. Calls to slots in vtable will happen in the thread-default main loop of the thread you are calling this method from. Note that all Glib::VariantBase values passed to functions in vtable will match the signature given in interface_info - if a remote caller passes incorrect values, the org.freedesktop.DBus.Error.InvalidArgs is returned to the remote caller. Additionally, if the remote caller attempts to invoke methods or access properties not mentioned in interface_info the org.freedesktop.DBus.Error.UnknownMethod resp. org.freedesktop.DBus.Error.InvalidArgs errors are returned to the caller. It is considered a programming error if the SlotDBusInterfaceGetProperty slot in vtable returns a Glib::VariantBase of incorrect type. If an existing slot is already registered at object_path and interface_name, then a Glib::Error is thrown. GDBus automatically implements the standard D-Bus interfaces org.freedesktop.DBus.Properties, org.freedesktop.DBus.Introspectable and org.freedesktop.Peer, so you don't have to implement those for the objects you export. You can implement org.freedesktop.DBus.Properties yourself, e.g. to handle getting and setting of properties asynchronously. object_path The object path to register at. interface_info Introspection data for the interface. vtable An InterfaceVTable to call into. A registration id (never 0) that can be used with unregister_object() if no Glib::Error is thrown. Registers exported objects at object_path with the D-Bus interface that is described in interface_info. This method overload, which does not take a VTable, is useful for marker interfaces. GDBus automatically implements the standard D-Bus interfaces org.freedesktop.DBus.Properties, org.freedesktop.DBus.Introspectable and org.freedesktop.Peer, so you don't have to implement those for the objects you export. Registers a whole subtree of “dynamic” objects. Copies of the enumerate and introspection slots usted to create vtable are used to convey, to remote callers, what nodes exist in the subtree rooted by object_path. When handling remote calls into any node in the subtree, first the enumerate slot is used to check if the node exists. If the node exists or the Gio::DBus::SubtreeFlags::DISPATCH_TO_UNENUMERATED_NODES flag is set the introspection slot is used to check if the node supports the requested method. If so, the dispatch function is used to determine where to dispatch the call. The collected InterfaceVTable will be used to call into the interface vtable for processing the request. All calls into user-provided code will be invoked in the thread-default main loop of the thread you are calling this method from. 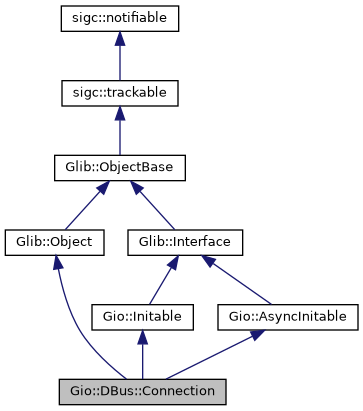 If an existing subtree is already registered at object_path or then a Glib::Error is thrown. Note that it is valid to register regular objects (using register_object()) in a subtree registered with register_subtree() - if so, the subtree handler is tried as the last resort. One way to think about a subtree handler is to consider it a “fallback handler” for object paths not registered via register_object(). object_path The object path to register the subtree at. vtable A SubtreeVTable to enumerate, introspect and dispatch nodes in the subtree. flags Flags used to fine tune the behavior of the subtree. A subtree registration id (never 0) that can be used with unregister_subtree() if no Glib::Error is thrown. Note that since filters run in a different thread, there is a race condition where it is possible that the filter will be running even after calling g_dbus_connection_remove_filter(), so you cannot just free data that the filter might be using. Instead, you should pass a DestroyNotify to g_dbus_connection_add_filter(), which will be called when it is guaranteed that the data is no longer needed. filter_id An identifier obtained from g_dbus_connection_add_filter(). Asynchronously sends message to the peer represented by connection. Unless flags contain the Gio::DBus::SendMessageFlags::PRESERVE_SERIAL flag, the serial number will be assigned by connection and set on message via g_dbus_message_set_serial(). If out_serial is not nullptr, then the serial number used will be written to this location prior to submitting the message to the underlying transport. If connection is closed then the operation will fail with Gio::Error::CLOSED. If message is not well-formed, the operation fails with Gio::Error::INVALID_ARGUMENT. Note that message must be unlocked, unless flags contain the Gio::DBus::SendMessageFlags::PRESERVE_SERIAL flag. flags Flags affecting how the message is sent. out_serial Return location for serial number assigned to message when sending it or nullptr. true if the message was well-formed and queued for transmission, false if error is set. A send_message() without an "out_serial" parameter. Asynchronously sends message to the peer represented by the connection. Unless flags contain the Gio::DBus::SendMessageFlags::PRESERVE_SERIAL flag, the serial number will be assigned by the connection and set on message via Gio::DBus::Message::set_serial(). If the connection is closed then the operation will fail with Gio::IO_ERROR_CLOSED. If cancellable is canceled, the operation will fail with Gio::IO_ERROR_CANCELLED. If message is not well-formed, the operation fails with Gio::IO_ERROR_INVALID_ARGUMENT. This is an asynchronous method. When the operation is finished, slot will be invoked in the thread-default main loop of the thread you are calling this method from. You can then call send_message_with_reply_finish() to get the result of the operation. See send_message_with_reply_sync() for the synchronous version. See the C API docs for examples. timeout_msec The timeout in milliseconds or -1 to use the default timeout. Finishes an operation started with g_dbus_connection_send_message_with_reply(). Note that error is only set if a local in-process error occurred. That is to say that the returned Gio::DBus::Message object may be of type Gio::DBus::MessageType::ERROR. Use g_dbus_message_to_gerror() to transcode this to a Error. res A AsyncResult obtained from the SlotAsyncReady passed to g_dbus_connection_send_message_with_reply(). A locked Gio::DBus::Message or nullptr if error is set. Synchronously sends message to the peer represented by the connection and blocks the calling thread until a reply is received or the timeout is reached. See send_message_with_reply() for the asynchronous version of this method. Note that a Glib::Error is thrown if a local in-process error occured. That is to say that the returned Message object may be of type G_DBUS_MESSAGE_TYPE_ERROR. Use Gio::DBus::Message::to_exception() to transcode this to a Glib::Error. A locked Message that is the reply to message or 0 if a Glib::Error is thrown. A non-cancellable version of send_message_with_reply_sync(). Sets whether the process should be terminated when connection is closed by the remote peer. exit_on_close Whether the process should be terminated when connection is closed by the remote peer. If g_dbus_connection_close() is called. In this case remote_peer_vanished is set to false and error is nullptr. remote_peer_vanished true if connection is closed because the remote peer closed its end of the connection. error A Error with more details about the event or nullptr. Subscribes to signals on the connection and invokes slot with a whenever the signal is received. Note that slot will be invoked in the thread-default main loop of the thread you are calling this method from. If the connection is not a message bus connection, sender must be 0. If sender is a well-known name note that slot is invoked with the unique name for the owner of sender, not the well-known name as one would expect. This is because the message bus rewrites the name. As such, to avoid certain race conditions, users should be tracking the name owner of the well-known name and use that when processing the received signal. slot Slot to invoke when there is a signal matching the requested data. sender Sender name to match on (unique or well-known name) or 0 to listen from all senders. interface_name D-Bus interface name to match on or 0 to match on all interfaces. member D-Bus signal name to match on or 0 to match on all signals. object_path Object path to match on or 0 to match on all object paths. arg0 Contents of first string argument to match on or 0 to match on all kinds of arguments. flags Flags describing how to subscribe to the signal (currently unused). A subscription identifier that can be used with signal_unsubscribe(). subscription_id A subscription id obtained from g_dbus_connection_signal_subscribe(). If connection was created with Gio::DBus::ConnectionFlags::DELAY_MESSAGE_PROCESSING, this method starts processing messages. Does nothing on if connection wasn't created with this flag or if the method has already been called. Reverses the effect of a previous call to g_dbus_connection_export_action_group(). It is an error to call this function with an ID that wasn't returned from g_dbus_connection_export_action_group() or to call it with the same ID more than once. export_id The ID from g_dbus_connection_export_action_group(). Reverses the effect of a previous call to g_dbus_connection_export_menu_model(). It is an error to call this function with an ID that wasn't returned from g_dbus_connection_export_menu_model() or to call it with the same ID more than once. export_id The ID from g_dbus_connection_export_menu_model(). registration_id A registration id obtained from g_dbus_connection_register_object(). true if the object was unregistered, false otherwise. registration_id A subtree registration id obtained from g_dbus_connection_register_subtree(). true if the subtree was unregistered, false otherwise.